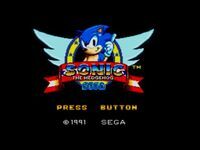 Sonic the Hedgehog is a platform video game that was released in 1991 for the Sega Master System and the Game Gear. It is distinct from the more popular 16-bit game. In addition to its original release as a cartridge, the game was later built into some versions of the Sega Master System II in Europe. Its plot and gameplay mechanics are similar to the 16-bit version, though some level themes and digital assets are different and Chaos Emeralds are scattered throughout levels rather than special stages. Gameplay as a whole is simplified; the level design is flatter and has a larger focus on exploration, with no vertical loops, and Sonic cannot re-collect his rings after being hit. The game has a different soundtrack composed by Yuzo Koshiro, which includes adaptations of music from the original version.